This is just a little peak at what I’ve been working on. I am making a bunch of tea bowls that will be given as gifts/favors at our wedding celebration this summer. It’s fun to think about these pieces going out to our families and friends all toasting out of these cups, then bringing them home as reminders of the celebration. Ian’s been having fun decorating some of the cups too. If I could just give away all the pieces that I make, I would be a very happy potter! But it’s not such a great business model… But I’m so happy to have the excuse to give a slew of pots away this summer! I was lucky enough to be invited to join in on the first firing of Donovan Palmquist and Colleen Riley’s new wood kiln this weekend. Below are some of the pots that I had in the firing. I’ll share with you the finished pieces when they’re out of the kiln! It’s really amazing to be in Minnesota. There are so many amazing potters here- and I’m having so much fun meeting new clay folks every week! There’s a new blogger around. Actually, there are quite a few! 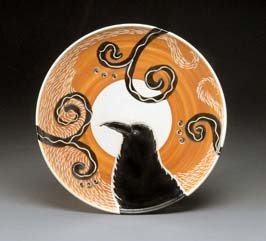 But I wanted to share with you Marcia Tani Paul’s new blog, Ceramic Arts: Clay, Food and More… Marcia is one of the many Minnesota potters that I’ve been lucky to meet. Take a look, and be prepared to be hungry! Congratulations to Michael Kline and his 1000th post on his blog, Sawdust and Dirt! Talk about prolific! Michael’s been such a great contributor to the clay blogging community- I’m looking forward to the next 1000 posts! I’ve been making a ton of cups in my studio over the past couple of months. You might have seen some of them in my last blog post. In the middle of cup making expedition, this Sequoia Miller wrote this great blog post about cups. It was a very timely read. This sweet jar of Sequoia’s is a cousin to one of his jars that I’m lucky to have in my collection. As you know, I have a big list of clay blogs that I subscribe to and enjoy reading while eating my steel cut oats every morning. I want to ask for a bit of help from you guys out there. Let me know if there are any blogs missing, and also if there are any that are defunct on my list. It’s time for an update! Just leave a comment below, or a note on my Facebook Fan Page, or send me an email. If you’re interested in setting up a blog reader with clay blogs to read over your morning coffee, I have directions on how to do it on my blogroll. A couple of reminder notes about my list. I have to keep the list limited in some way- so I only include clay blogs, and mostly pottery blogs at that. And I try to limit them to ones that have mostly clay content. And it needs to have original content- not only Etsy listings or sale updates. If you want a really complete list of blogs, check out the really complete list over at Slipcast, The Ceramics Blog. It’s impressive! Perhaps a little more than usual, this week has been a bit of a balancing act between working in my studio and working on this blog. I’ve been on a roll getting the new site for my blog up to where I want it to be (obsessed, some might say). But I’ve also been building up for a soda firing all week. Surprisingly, I think I’ve actually been making good progress in both sides of my clay world. I’m spending my Sunday firing the my first soda kiln of 2009. There are some espresso cups and saucers that are at about 2200° I’m dying to see in a couple of days! Today’s post is a bunch of odds and ends about blogging that I’ve been meaning to write about. Nothing big enough for it’s own post, so I threw them all together. Take a look at the visual archives (also located in the top tab labeled “Archives”). When I was digging through the old posts and tagging and categorizing everything, I came across a lot of information that is pretty timeless. I wanted to make these older posts really accessible to dig through and came up with this page. Also take a look over at the sidebar categories (located in the right hand column. I can’t give you a direct link, you’ll just have to look to the right side of any page). As I mentioned above, I spent a lot of time re-categorizing and retagging all old posts so they’d be extra easy to search through and I created a parent/sub category system that I think should be pretty easy to dig through to find what you may (or may not be) looking for. This took a shocking amount of work, but now that the archives are done, I can move forward and just keep things properly categorized as I go so there won’t be such a big chunk of work moving forward. Another new feature that can be found on the right sidebar is some shared posts from other bloggers from my Google Reader. I have been in the habit (not always very consistently) of “starring” posts (a GR thing) that I want to look back at, share a link or maybe comment on. I turned this into a list of posts that you can read on it’s very own page and even subscribe to. Now that I have created this way to share, I’m planning on being a bit more consistent with marking posts that I want to share. If you want to share items from your blog reader to your friends and readers, this will help you get started on your own share page. Even if you spent some time checking out my pottery blogroll last week, you should take a minute and check back. Several new blogs have been added. And if you’re interested in using Google Reader but feel like you need a little more help, you might find this interesting. One of my goals (or resolutions if you prefer) with this blog and other clay blogs I read is to do more commenting and replying to comments. It takes some time and energy, but it is a big part of blogging that I thoroughly enjoy. I like the commenting/ reply system on WordPress better than Blogger and I think it’ll be easier for everyone (including myself) to continue the conversation on beyond the actual blog post. And I’ve been adding in a couple of features that improves upon the commenting system just a little bit more. A gravatar is a globally recognized avatar. You can create your own little image and connect it with you email address(es) and it’ll automatically show up with your comment on this blog and on many others. I really like the extra personal touch. It becomes a little more like a conversation than just commenting. It’s easy to make your own gravatar and it only takes a couple of minutes. To help continue the post-post conversation: Each time you comment, you’ll see a little box that you’ll need to check so you can get an email when there are more comments and responses to the post that you just commented on. Make your own little favicon for your site with this site and this plugin. If you’re on my site, you’ll see a little tiny mug by the url. This little detail makes me very happy. This plugin for WordPress will make a nice little excerpt and choice of thumbnails when you post your blog to Facebook, etc… I’ve been really happy with this feature. My old blog would just have the URL, no image and no text which made it not very interesting to post something. Simple and spiffy. And on a totally unrelated topic: You might remember an earlier post about Bison Trimming Tools. I just got a tip from Jeanette Zeis that Bison Tools are now being sold through Etsy! It’s time for me to head back to the kiln and put the second round of soda in. 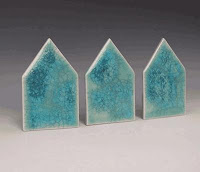 I’m enjoying the warmth from the kiln on a very chilly (and snowy) Chicago night. Pictures of the new pots will come soon! This post is a version of my new blogroll which can be found on one of the top tabs on the new site. It was way too big to list in the side bar of the site so I gave it it’s own page. After a lot of work (and a little lot of help), I was able to create thumbnail snapshots of the blogs to break up the very long list and add a little visual interest. The blogroll that is on the top tab is connected to my blog reader, so it updates whenever I add or subtract a blog automatically. In addition to writing this pottery blog, I also am an avid reader of clay focused blogs written by other ceramic artists. There are more than 100 blogs on my blogroll that I read daily through a blog reader. (I really do read all of these blogs listed!) It can be a bit overwhelming at first, but once you’re caught up, it’s so nice to start your day catching up with potters from around the world. At the bottom of this list you’ll find directions for connecting this list to your blog reader so you can read them regularly too. Because this list could be endless without some restrictions, I do have some perimeters for the blogs here- they need to be mostly about clay, have original content and are updated semi-regularly. This is not a complete list (I did title this as semi-complete). I “discover” new blogs every week and wonder how I possibly could have missed them before. Let me know if I’m missing anything! There is no way that I could remember to check in with these blogs on my own, so I use the blog reader, Google Reader, to subscribe to these blogs. Instead of visiting all the sites, the newest posts are compiled into the reader automatically and keeps track of the unread ones, etc… It’s very easy to set up (really…it is!). If you’re interested in subscribing to my list (above), and you’re using Google Reader, just follow these simple steps. Click on”Browse” and locate the downloaded file. You can always use this as a starting point and add and subtract subscriptions from this list to suit your interests. And if you’re overwhelmed by the number of posts that appear in your blog reader, you can always “mark all as read” and start reading from that point forward. Pottery Blog is now on WordPress! I’ve been talking about doing this for months… I’ve finally made the switch. On Christmas morning Ian surprised me with the fantastic gift of moving the content and comments of my blog from Blogger to WordPress. It was the beginning of a huge project that I’ve been working on steadily ever since. Adding content, tweaking the template, plug-ins and reorganizing tags and categories. If you’re reading this post on a blog reader or through an email, I encourage you to take a minute to visit the PotteryBlog.com directly. And if you’re on the actual website, take a look around at the new digs. I’ve been working on lots of features that will be both visually interesting as well as make the site easier than ever to use. Some of the things I’ve done will be obvious, like the extensive categorization of the archives. Others will not be quite so obvious, like when you post a link from Pottery Blog on Facebook, the post will be excerpted and you’ll be able to choose the accompanying thumbnail image. I will be doing a series of posts that will highlight some of the new features over the coming week. And there are still some major changes/ additions coming too! Thanks Ian! I definitely couldn’t have done this without you! Four Years of Pottery Blog! It’s a bit of an anniversary for me… It’s been 4 years since I first started writing PotteryBlog.com. It all started about 4 and a half years ago at NCECA – Indianapolis. I had attended a number of panel discussions and lectures given by writers, editors and publishers of both books and magazines. I found myself inspired by the words I had heard throughout the week and the conversations had, but I wasn’t quite sure where to go with it. I knew that I wanted to write, but the time lines for traditional media didn’t appeal to me. Magazine articles usually took about a year to be published, and books could be 3-5 years. I wanted to go in the direction of something less formal and with more immediate feedback, for now. On the trip home from Indianapolis, a conversation started with my friend Brian Boyer (programmer, writer and potter). He really felt that a blog was the direction to go in with my post-conference energy. Ian and I had many conversations at home and he had been urging me to start a blog throughout the previous year. My hesitation was that I didn’t know any other potter that was writing a blog about clay. A huge part of blogging was the connections with other bloggers writing in the same field. Blog writers are great blog readers, and when you begin to link to each other, your audience can grow exponentially. But after the conference, and my conversation with Brian, I realized that it was what I was going to do. And so I went home, registered the domain name: PotteryBlog.com, and soon I began to write. I had no idea where it was going to lead me, but I knew it was were I wanted to be at that moment. When I started this blog, I had to do a lot of educating. The question that I got from most of the clay folks that I talked to about my writing endeavors was “What’s a blog.” I guess it’s a question that I still get, but in the beginning it was the question that I got from everyone that I talked to about it. I continued to write for the next 2 years. Not on a super regular basis, but regular enough. A couple of years into it, I had that nagging feeling that maybe no one was reading my blog. A large part of writing a blog is personal, so theoretically, I would continue to write with or without readers. But when you send your words and images out there, you do hope that someone is reading them. The other top question that I get on a regular basis is: why? Why do I spend my time and energy into writing this blog. Why do I “give away information for free” (their words, not mine)? The answer is pretty simple: information is free. I would love to give away pots, but it’s not the most sustainable business model. Ian (my significant other of 12+ years) is an open source programmer. He’s rubbed off on me over the years. The idea with open source is that the programming code and/or the process of writing it are open for others to see and use and that by making it public, the larger community will benefit from the sharing of information and collaboration. With programming, you can easily do this regardless of geography. With clay, it’s not so obvious on how to do it, but I think blogging is has been a good way to do “open source ceramics”. If I give you a pot, now you have a pot and I don’t have that pot. But if I give you an idea then we both get to keep it. The open sharing of ideas might be the overarching reason on why I write, but I’ve discovered many more benefits to blogging. I have found that writing has greatly impacted my work. The conversations I have with myself about my own work have grown and evolved, affecting the aesthetic decisions I make daily about my pots. As a visual artist I’m used to falling back on the thought that my work will speak for itself. I hope it does, up to a point, but there is something to be said for backing it up with words. And obviously not everything I write is that profound (like instructions on covering your remote with plastic). But when I have to be more serious and thoughtful about my words, like when writing an artist statement, it comes easier than it ever has before. The habit of writing makes writing easier. Two years after I began this blog, I once again found myself at NCECA (Louisville) and throughout the week had some amazing conversations with people that “knew me” from my blog. I suddenly realized that my blog posts were not just disappearing out there, but they were being received on the other end by ceramic artists that not only knew what a blog was, but were excited to be reading one that focused on clay! Once I had the knowledge that people were out there across both the US, but also around the world were reading, I was energize and completely dove into the blog. When I got home I started writing more regularly. I also started to pay attention to the statistics on who was reading my blog. And I set up an email list so readers could automatically get an email with each post. Knowing people were out there on the other end really pushed me. I’ve had a website of my work, in one form or another for the past 9+ years. I used to be conflicted about having pots online. They are 3-dimensional and tactile; things that don’t usually go so well with the internet. I think that a blog helps add other dimensions to the piece. You can show the pieces in progress. Talk about the process of making. Show the pieces in use. Talk about inspirations and frustrations in making. Some of the blanks begin to fill in and the connection between maker, pot and user has grown stronger. Stronger than I ever could have imagined way back when I began my first adventures online. There have been some great and unexpected side effects of writing my blog. It turns out that it is the best kind of publicity: it’s publicity as a side effect. I get to put my efforts into what I want to do: write, teach, share my work, and connect with others. And it just so happens that it’s publicity. I’ve been lucky that I’ve been asked to be in a number of invitational shows where the curators, jurors and gallery managers have found my work and gotten to know it through this blog. It’s also allowed me to keep up with regular customers. They can check in and see what I’ve been up to easily. The email list, RSS feed and blog reader instructions have been really important. I wrote a while back about the concept of 1000 True Fans. I’m far from it, but my blog helps me on my path. Ever since my return from NCECA in Louisville 2 years ago, something really exciting is happening! The number of clay focused blogs has grown exponentially and an incredible international community of clay bloggers has developed. It’s a community that I feel very lucky to be a part of, to have these relationships with my readers and other pottery bloggers. I’m learning a lot, both technically and personally. I have at least 6 other posts in progress, and another dozen ideas in my head, but if you ever have any suggestions, I’m glad to hear them and respond to them. I find that the more I write, the more I want to write (like this past week). I will continue to have tutorials, studio updates and show announcements. But I’m also expecting the unexpected, just like when I began. You never know where life (or a blog) is going to take you. Thank you for reading my blog. Please share your thoughts about pottery blogging with me and the other readers in the comments, it’s an important part of the process for me. It would be quite a different experience entirely for me if I wrote without comments. The posts would become static. This post doesn’t end with this sentence, it ends with the last comment at the bottom of this page. First of all, I want to thank everyone for the incredible response to this week’s posts, especially the overwhelming response to the Search Engine Optimization post. There is some great energy happening around the clay blogs this week- conversations starting had by commenting back and forth, linking and sharing of one another’s posts, and lots changes being made on the pottery blogs to improve search results. I’m so glad that it’s been useful and may have sparked the interest of some of you out there! I have gotten several questions on why I am planning on making the switch from Blogger to WordPress. Luckily, Cynitha of Colorado Art Studio just happened to write this fantastic post today that just happens to answer this exact question in it. She made the switch a little while ago. It’s also a must read article if you were at all interested in my post earlier this week about SEO. I know it’s all a bit overwhelming, but you just need to jump in and start chipping away. (I’m reminding myself of this too.) One part of Cynthia’s answer that isn’t quite the same for me is that she was switching from a .blogspot account to her own domain so some of the growing pains won’t be the same for me since I am already using my own domain name (that will only really make sense if you read her post). I will go into depth about this whole change over process when it actually happens. We’re leaving in a couple of days for a big trip, so I’ve decided it would be best to wait until we get back to do it. I was having flashing of breaking something in the move, and then being out of the country for a couple of weeks and the blog being broken the whole time. Good luck to all of you working on your blogs! I have once again updated my blogroll of clay focused blogs. It’s getting loooong. But I seriously do read all of these blogs. As I have mentioned before, I use a blog reader, Google Reader, to keep track of my subscriptions. I could never actually keep track of all of these without it. I also use Google Reader to create my blogroll over there in the side bar automatically. If you’re a blogger and you’d like to do this on your website, check out this tutorial. Or if you’re want to do it a different way, you can try this. There are lots of updates in this list. I’ve removed some that haven’t been updated in 7-8 months+, plus added all sorts of goodies. Every week I’m finding new blogs. I’m often surprised when I come upon a ‘new’ blog that has actually been around for several month. Why didn’t I know about it? If I’m missing something, let me know! I hope you dive into these clay blogs and find some that really speak to you. There are so many different perspectives and so much knowledge. I think you’ll never be bored again. If you’re interested in subscribing to my list, and you’re using Google Reader, just follow these simple steps. Click Upload and then start reading! You’ll be overwhelmed with posts to read at first, but once you get caught up, it’s quite manageable :)You can always use this as a starting point and add and subtract subscriptions from this list to suit your interests. I hope you don’t mind my heavy posting this week. I’ve been traveling a lot this summer and I have been writing, but I haven’t always had the time to complete a thought, edit or ability to upload. So I have a back log of partial post. I’m leaving for Berlin and Amsterdam in less than a week and I want to try to get as many finished and posted as I have time for. This is another big one, but if you (or someone you know) has a blog or website, or you are planning to one day, I think this information will be pretty valuable. When you write a clay focused blog, your intention is that someone out there will read what you’re writing. In the beginning you’ll have friends and family that will read your blog regularly. Then maybe some regular customers and other ceramic artists that you’ve gotten to know. But if you want to have other people, people outside of your circle, start reading your blog, you need to put some effort into it. There is some straight up time that you need to invest, and then there is a bit of retraining yourself on how you blog to help get others to find your blog. If I Google “Pottery Blog” or “Ceramics Blog” or some sort of similar thing, I’m surprised at the top 30 results. There are things that haven’t been updated in years or month, or ones that are sort of spammy. But some of my favorite (and I know highly read) pottery blogs aren’t near the top listings as they should be. Why aren’t they? This is something that I can’t stress strongly enough. Google doesn’t seem to index sites that are name.blogspot.com or name.wordpress.com very well so they can come up low in search results. And if your domain name has something in it like your name, or something describing your process, that will be an added bonus to help get better search results. You can sign up for a domain name for only $12/ yr. on Joker.com (Network Solutions charges $35 for EXACTLY the same service). Or if you’re using WordPress.com, it’s $15 for your domain name and hosting for a year, or if you already have a domain name, then it’s only $10 for hosting/ yr. If you’re using Blogger, then it is no extra cost once you’ve purchased a domain name (hosting is free! ), or you can buy your domain name directly through blogger. By purchasing your domain directly through WordPress or Blogger you’ll save a step in the whole process of setting up your own domain. It’s a VERY small investment for your biggest impact (think about the price of postcards…). And it’s a heck of alot easier to tell people your blog’s address. While I use Blogger, if I was starting a new blog I’d start with WordPress. I label all of my pictures very conciously. I might name something: stoneware-vase-soda-fired-Emily-Murphy.jpg* It’s long, but Google likes all the descriptor words and my images come up very high in search results. There was a period of training that I had to go through, but it’s second nature now and doesn’t take much extra time. I mix it up too. Use “sodafired” and “soda-fired” or maybe I’ll throw in “Chicago” or “pottery.” It allows different pictures to show up in different search results. *You might have noticed the dashes in my image name. You can’t have any spaces in your image name (at least in Blogger you can’t). Use a “-” or “_” to separate words. Diversify your words. This is another one of those things that you have to train yourself on. Words. Google loves words. Words are the main reason that your blog/site will show up in search engines. If you just have pictures with minimal text, Google won’t pay that much attention. That isn’t such an issue with blogs. But what you can do is diversify your words. For example, don’t just use the word pottery: use clay, ceramics, tableware, stoneware, porcelain, dinnerware, pots, etc… mix it up. Do this conciously at first and eventually it’ll flow when you write. Below I have some information on Google Analytics. One thing that you can see on Google Analytics is the key words and phrases that people are using to find your site. Maybe you think that everyone is searching the term “pottery” because that is your go-to search term. But you might find out that everyone else is looking up “honey pot” and “wax resist.” You just don’t know what people are searching for, but if you diversify, you’ll have better results. You might be inspired to write about wax resist more often because that is what people are searching for. Use straightforward titles for your post. The title becomes the url for your post. If it’s full of useful information, it’ll do better in search results. If you use WordPress and your url has %P=5 or something like that in it, there is an easy setting that you can change so you have better urls. Use actual text, not images. This one is a problem on a lot of websites. You want to have control over the fonts, so you turn your address (for example) into a nice little graphic. Unfortuately it makes it so Google can’t “read” your address. Incoming links give you status. Along with the words that you use, it’s the top thing that gets you up high in search results. You can get them for “free, ” you can pay (not something that I do), or you can link to someone and have them link to you (sometimes it’s reciprocal, sometimes not). Sign up for various blog search engines. It won’t actually get you much traffic via the sites, but it is usually a free incoming link (just Google “free blog listings” or “blog search engines”, etc…) Here is a list of search engines by type. It might give you some ideas. Link to your blog from your social networking site, like Facebook. You can even add your RSS feed on different sites, like here. StumbleUpon. This is huge. I’m always surprised and the number of visitors I have from StumbleUpon. I don’t even know how to expain it. Just go there and see. There are days when it’s my #1 referrer. Link from your regular site to your blog (sounds obvious, but it must be said). Link to other people’s blog. Share a link to a specific post on their blog on your blog. Be GENEROUS with your links. And then be patient, they’ll come. I’m not a fan of asking someone directly “I’ll link to you, if you link to me.” Put it out there and it’ll come back to you (both good Karma and links). The top referrer sites for my blog (outside of Google and my own site) are Michael Kline’s blog and Ron Philbeck’s blog. Comment on other people’s blogs. Do it because you want to, but enjoy the side effects. People are more likely to read your blog if comment on yours. They want to see who is reading their blog, so they’ll follow the links. There is often a place for your website to be listed. Or at least a link to your Blogger Profile where a link to your blog can be found. And it’s also the best way to be part of the great and generous community of clay bloggers. Some great conversations happen all happen in the comments. The more comments you put out there, the more that you’ll get on your site. And commenting is good for the soul. Combine the previous two points- comment on a blog on your website (with links and everything). It could be the start of a great conversation. One of the main reasons that you have a clay blog is to get your work known in the world. People that live near you are the ones most likely to come to your booth at an art fair or stop by your studio when it’s holiday shopping time. Make it clear where you’re from, and get it out there that you’re a potter/ tile maker/ sculptor who live in mid-size city, USA. And if one of your loyal blog readers happen to be visiting you mid-size city, they’ll be excited to come visit you. Do you belong to a guild, art group or some other group that has a website that will link to you? Are there free papers and sites that you can list in for “things to do” or “galleries”? Is there a local tourism site? Put your studio address on every page (usually a footer) so that search engines can associate your pages with your location. Once you have people hooked on your blog, you want to make it EASY for them to keep up with your bountiful postings. There are 2 main ways to do it. Use an email list. Clay people aren’t necessarily blog readers, but you want them to be. The easiest way to do this is to set up an mailing list where people can sign up to automatically get an email from you whenever you write a new post. I think there is also a way to do a mailing list through FeedBurner. I have mine set up through Google Groups (go here if you want to see it or sign up for it). Have an RSS or Atom feed and encourage people to use it! If you don’t have a feed, people are going to have to remember to come back to your blog and read it. There is so much to remember to do, don’t make people remember to manually go back to you blog to see if you wrote or not. I read 90% of my blogs through my blog reader. For more information on using a blog reader, go here. Remember that clay blogs are still pretty new and there is still a lot of educating to be done. Do some educating on how to keep track of blogs. If you don’t want to write about it, you can alway share the link to my post about the subject. A common feeling that is had by anyone who blogs is that no one is reading it. Well, it just isn’t true. There are ways to find out who is reading your blog. When you start getting back the results and realize that people from all over the world are reading your blog, you’ll be energized and you’ll write even more than usual. Just remember, it’ll take time- usually up to a month, to start getting true results from these sites. Google Analytics. I LOVE Google Analytics! I can find out where people are coming from from countries to actual cities and towns. I can see all incoming links to me, find out how long they were on the site, etc… I love seeing the key words and phrases too. Some can be quite surprising. Google Webmaster. I haven’t figured this out, but you should sign up for it and see what it does for you. It has some tools to help Google see content on your site. Some of what it does is handled automatically by the blog software. Feed Burner A good way to manage your RSS/Atom feeds, and potentially a mailing list. You can also find out how many people are subscribed to your feed. If people are reading your blog via a blog reader, they will not show up on your Analytics results. You need something like this to find that out. Technorati I can easily keep track of all my incoming links (from other blogs) on here. Quantcast I just discovered this, so I don’t have enough info to know if it’s good or not. I hope this was helpful to you. I suspect this will be one to bookmark and take a while to go through (if you’re a blogger). If there are some tips and tricks that you use, share them and I’ll update this post. Although I am talking about search engine optimization for clay bloggers, it’s applicable for websites and non-ceramic focused sites too. If you think that other people might find this post useful, put a link to it up on your site. Thanks for reading! 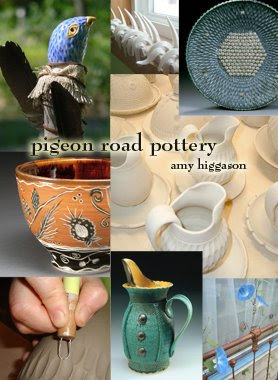 I’m so excited to share with you a new clay blogger (and old friend): Amy Higgason of Pigeon Road Pottery. Amy was a long time studio member at Lillstreet until several years ago where she left her job as a graphic designer and her home in Chicago for the woods of Wisconsin to become a full time potter. Amy has written many email updates over the years to friends and family about her endeavors in clay and life. They are always beautifully written and full of wonderful photos. It’s only natural that she’s now blogging. Head on over to her blog and have a read. One of the challenges that Amy faced with her work when she moved away from Lillstreet was to transition her work from c.10 soda and reduction to c.6 electric. It amazes me how she has kept the feel and aesthetics of the higher fire work in c.6. And if you ever find yourself in northern Wisconsin, stop by her studio in Lake Tomahawk, Wisconsin.